The Risk singer Ashley Baptiste has turned down his chance at stardom by walking out of the X Factor. Ashley quit boyband The Risk just days before they sing live to millions on Saturday's episode of the ITV1 show. His decision has given X Factor flop Ashford Campbell a second chance after he was asked to fill his place. 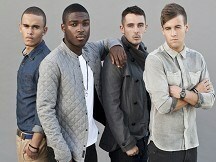 Ashford was previously a member of the boyband Nu Vibe who were voted out in the early stages of the live shows. He was summoned to the X Factor studios on Friday to rehearse with his new bandmates ahead of Saturdays show after they asked their mentor Tulisa Contostavlos if he could join. The boys said: "We're devastated that Ashley has decided to leave but we respect his decision. "After taking in the news we decided that we didn't want to be a trio, we really wanted another member. We have always liked Ashford, right from bootcamp, and always had a strong bond with him. Ashley said: "It's been a really tough decision but I have decided to leave The Risk. I don't believe my future lies in a boyband and it's not fair on Charlie, Derry and Andy to remain in the band when I am not truly committed to it for the long term. "I believe The Risk can win the X Factor and I'm backing them all the way. I count them as my friends so I know we'll stay in touch." Tulisa said she was "gutted" to see Ashley go, but added that Ashford was "a fantastic fit".